The Pacoima Wash Vision Plan doesn't choose between modes, but seeks to accommodate all of them. That's one reason that the rift between cyclists and horse riders that was so apparent during the Bike Plan process is not even on the map. All renderings via Mia Lehrer and Associates. One of the lessons that the world’s great cities learned is how to use natural and man created landmarks to strengthen and create great places. 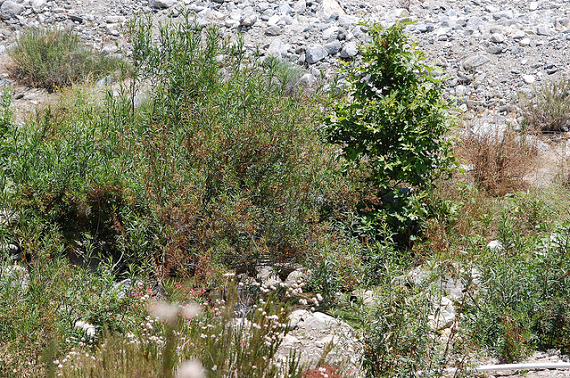 This is one area where Los Angeles still lags, and nowhere is this clearer than in the case of the Pacoima Wash. The Wash is a tributary of the Los Angeles River (actually a tributary of a tributary, but who’s counting) that runs through the San Fernando Valley from the Pacoima Dam southwest through Sylmar, the city of San Fernando and eventually Pacoima. Instead of being a vibrant open space designed to connect disparate communities and bring people together outdoors, the Wash is a physical barrier as real as a freeway or freight rail line. The land surrounding the Wash is kept behind fences, the trail running parallel is closed to the public and behind bars, instead of people, the Wash’s greenspace is a resting ground for weeds. But a non-profit environmental justice organization known as Pacoima Beautiful wants to change all that. And with the help of the L.A. County Department of Public Health’s Policies for Livable and Active Communities and Environments (PLACE) Grant they will soon have an official plan to help do so. The first step in the process of turning the Wash from eye sore to community anchor is to create a vision for the area, a vision that is informed by representative of the community, and that’s what Pacoima Beautiful and its allies are trying to do. And help for the community can’t come soon enough. Pacoima is a desert when it comes to open space, even with the large Ritchie Valens Park located just off the 118 Highway. Pacoima has 54.3 acres of park space. According to the LA City General Plan, the ideal ratio of park space is 4 acres per 1,000 residents. Because Pacoima has over 100,000 people its ideal ratio,is close to 400 acres of park space. The lack of open space is one major factor in the poor health of many Pacoima residents. Twenty five percent of Pacoima residents suffer from heart disease and another 6.3% from diabetes. 17% of Pacoima residents are obese, including a shockingly high 29% of youth. For comparison purposes, the other three PLACE Grant cities that we’ve studied all have lower rates of youth obesity: 17.6% in Glendale, 18.5% in Culver City and 22.4% in Long Beach. 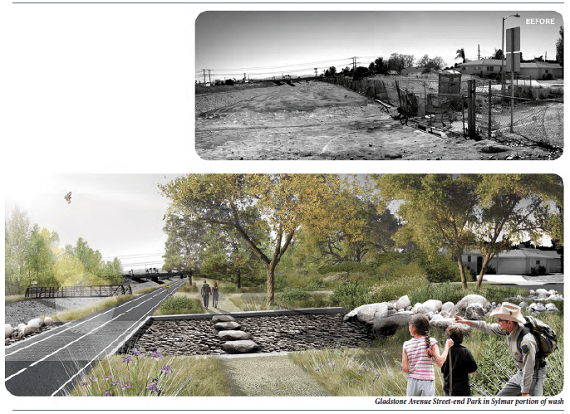 If the Vision Plan comes to fruition, the Pacoima Wash will be transformed. That can't happen soon enough for the people of Pacoima. Farther North, San Fernando and Sylmar will benefit too. Enter the Pacoima Wash Vision Plan. The final document isn’t completed yet, but the plan was made to work with plans of the City and County for the region and would dramatically change the Wash by creating a series of parks, a mixed-use bicycle and pedestrian trail and create other needed amenities to allow people to move through and gather at The Wash. The Vision Plan also cooperates with the City of San Fernando’s plan for the Wash. San Fernando sits between the Sylmar and Pacoima communities as an independent city and has its own Wash Plan. The dream of continuous green space for the Wash would be doomed without San Fernando sharing the same vision. By including the Vision Plan in Planning Department ‘s outreach for a new community plan, Pacoima Beautiful assured more buy-in from city staff to keep the Vision moving forward and Cerna believes the focus on public health will lead to more rapid funding of the plan’s plans. For professional help, Pacoima Beautiful brought in Mia Lehrer and Associates, a local architecture and design firm that worked on the City of Los Angeles River Master Plan which covers 32 miles of the 51 mile river and a similar project in Compton for Compton Creek. Standing in front of the “El Dorado Parcel,” it doesn’t look like much. The City of Los Angeles purchased the two acre parcel a couple of years ago to be the first of the new parks along the Western side of the Wash. 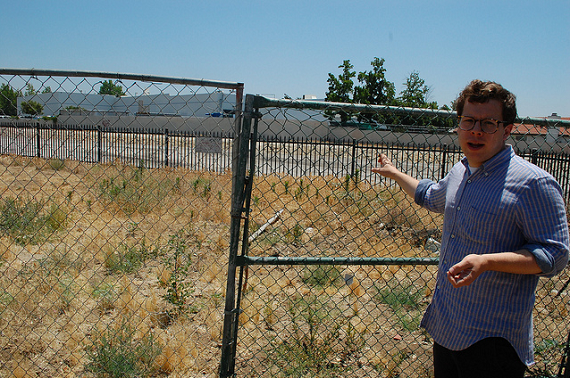 But when Podemski and I visited the parcel this summer, it looked like dirt, gravel and weeds behind a steel fence. The prospect of a park seems distant. The site is a long triangular parcel on the western side of the Wash running between Telfair Avenue and El Dorado Avenue. To the west of the parcel are a series of single family residences. A mix of different types of walls separates this parcel from the residences including wooden fences and cinderblock. The parcel is not a benefit to the community as it currently exists. In the summer, the overgrown vegetation is a fire risk. Year round, the walls are a target for taggers looking to leave their gangs mark in a never-ending turf war. There is not a specific plan for the park, but the residents envision an area where people can access the trail to the east. They see places to sit and recreate or have a conversation. They see the potential for community gardens, flower beds, and even picnic areas. PB is working with the Mountain Recreation and Conservation Authority and the city to write grants to convert the land into “passive open space.” Up and down the Wash there are many of these abandoned grass lands, and a federal grant from the Environmental Protection Agency will help Pacoima Beautiful decide which lands can be turned into parks and which are less desirable targets. The necklace may be closer to completion than seems possible today, at least in the Pacoima section of the Wash Plan. Just to the South of the El Dorado site is a thin patch of grass maintained by the local homeowner’s association. When El Dorado is completed, it would provide a long stretch of grass and open space covering much of the Pacoima portion of the Wash Plan between Ritchie Valens Park and San Fernando Road. It may be a Vision Plan created by Pacoima Beautiful for the Pacoima Wash, but Sylmar's portion of the Wash is every bit as important. It’s a little easier to picture how things could change in Sylmar. At the northern end of the Wash, the growl of motorized dirt-bikes provides some white noise as Podemski unveils the natural beauty that seems somehow untouched by the sprawling development that marks so much of the Los Angles region. The desert vegetation provides a beautiful scene that is about as far from the average vision of Los Angeles as one could get. Traveling south down the Wash, there are a series of spaces that are perfect candidates for pocket parks, we won’t know which ones until a study funded by the EPA to study Brownfield opportunities is completed. Many of these potential parks happen to be located at some of the most beautiful natural views in Los Angeles, making the series of parks an especially attractive alternative. Past the Lopez Debris Basin are even more opportunities for pocket parks. As with the El Dorado parcel, many of these areas attract dumping, urban encampments, and gathering places that harbor drug use, gang activity, and vandalism due to their isolation from the community. Creating new parks at these locations won’t just create open space for communities that desperately need it, but will allow the community to reclaim open space stolen by scofflaws and more serious law breakers. Would the existence of a great mixed-use trail such as this one make Pacoima a more Livable community? What makes the Vision Plan a true vision for the entire Wash area and not just a series of park is transforming the asphalt road. 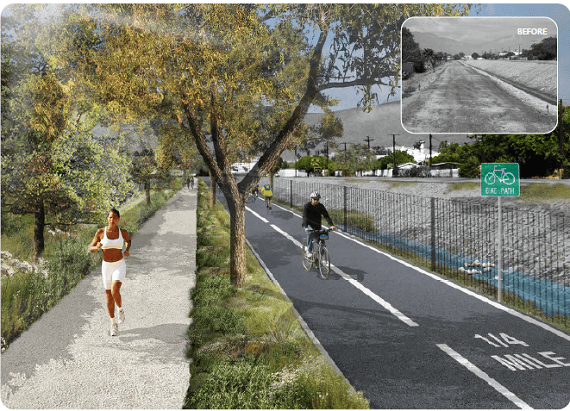 The Vision Plan calls for a series of Class I Paths (bike trails), Class II Paths (bike lanes) and Class III (bike routes, typically with Sharrows) to connect the northern most tip of the Wash in Sylmar all the way south to Ritchie Valens Park. In places, the Plan envisions a mixed-use trail with separate space for bicyclists and pedestrians. In other areas, cyclists are separated from horse trails, allowing all users in the area to access a large and unique area of the city. Along the paths will be water fountains and other rest facilities, entrances and exits to the pocket parks, benches and other park amenities, lighting (where it won’t impact the wild life) and perhaps most importantly, way faring signage. Wayfinding signage is an important deterrent to crime encroaching on the path. As we saw in 2008 with the Ballona Creek Bike Path, it’s almost impossible to get a police response on a bicycle path if a rider is assaulted on a bike path without a clear knowledge of where they are. Even GPS doesn’t help as many bike paths are not marked in mapping programs. Cyclists traveling from the south will be able to connect to El Cariso Regional Park, a variety of moun¬tain hiking trails in the Angeles National Forest, and to the Rim of the Valley Trail further to the north. 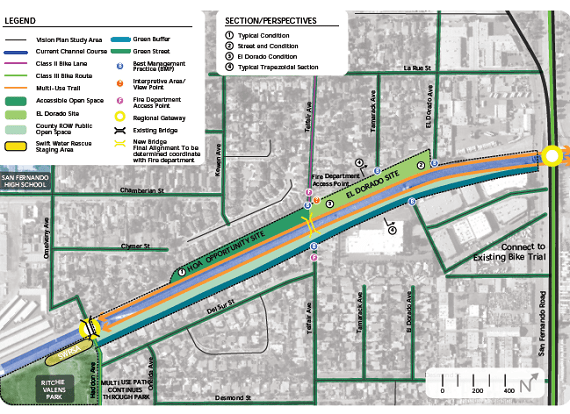 The Draft Los Angeles Bike Master Plan has designated the Pacoima Wash as a bike corridor. Because of this designation it is a high priority for the Sylmar Segment of the Pacoima Wash to provide a Class I bike path for the entire length of the Wash. At this point in time, there is no start date for the bikeway, but will be a crucial part to the success of the Pacoima Beautiful Vision. Much of the Class I Bike Path will run along the west side of the wash, where there is currently a limited access, access road that is fenced off for all but city and county workers and scofflaws who use the trail out of disregard or need. The path will have a minimum 10 feet wide right of way with a paved surface from Gavina Street to the Lopez Debris Basin. 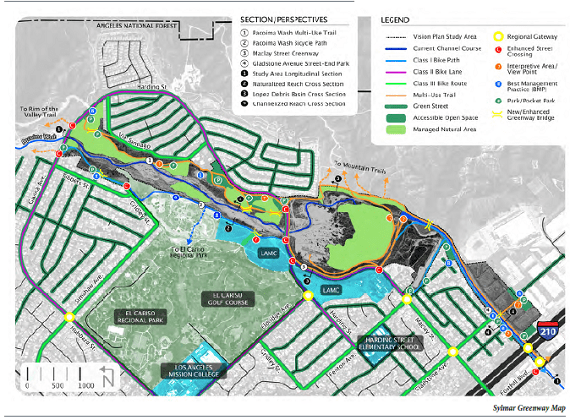 This path will link the multiple recreational amenities in this area such as the Sylmar Hang Gliding facility, baseball fields, a path to El Cariso Park, and recreational facilities at Mission College. The path will accommo¬date pedestrians and will provide a paved, gradually graded alternative for walkers and joggers than a hik¬ing and equestrian trail on the east side of the Wash.
Near the Lopez Debris Basin, cyclists will be able to access a Class II bike lane on Harding Street and Maclay Streets for local trips. Cyclists will have the option of recon¬necting to a Class I path running along the Pacoima Wash channel right of way below the Debris Basin or can remain on the streets, proceed down Maclay Street and reconnect with a Class I path on the Pacoima Wash at Foothill Blvd. In Pacoima, the Wash has a significant right of way on either side that is ideal for a multi use path. In some portions, the right of way is over 50 feet wide and is never narrower then 10 feet, providing enough room for bike and pedestrian paths. 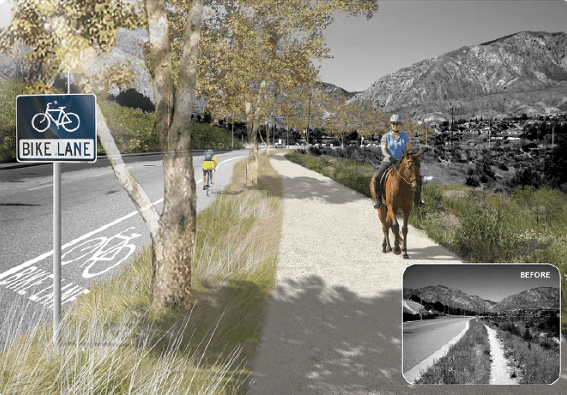 As in Sylmar, the multi use path will run along the Wash where possible and will extend into the community with Class II and Class III paths and bike lanes where possible. The Pacoima portion is also in the city’s Bike Plan and is also needed to connect the parks, schools, recreation centers and even job centers. Barbara Romero, with the Mountain Recreation and Conservation Authority notes that the Vision Plan’s idea for a Bike Path would actually make the area much safer for users. Currently, there’s no way to “close” the path to those accessing the trail illegally or warn them of unsafe conditions. By adding new fencing and gates that will come with the paths and parks, the city and county will have more options to open and close the trails pending severe weather or other unsafe conditions. The Vision Plan discusses, but doesn’t really focus on, the use of the long mixed-use trail as a transportation option or part of longer trips. When completed, the trail will allow car-free (by choice or necessity) residents of or workers in the Valley new low-cost ways to get from point A to point B or new ways to access the transit, especially the Orange Line’s rapid bus service, that wasn’t readily available before. As we saw with the new bridge connecting Ritchie Havens Park with the San Fernando High School, ability to cross the Wash is something that needs improving. The Vision Plan calls for a series of well built and maintained bridges to connect communities across the Wash, connect the facilities on the east and west portions of the wash and provide access to the Greenway, parks and Class I Bike Path to anyone who doesn’t have access to the west side of the Wash. Of course, those living on the West portion will also have easy access to those on the east. One of the more dramatic changes to the existing landscape happens at this "intersection" of the Wash and Gladstone St. in the Sylmar section of the Valley. “Something this large won’t get built out all at once by different groups,” says Frederick of the Vision Plan. Just the bike trail will most likely require the cooperation of L.A. County, who owns the land, the City of Los Angeles, Metro (who has funded parts of almost every commuting bike trail in the county) and a host of government agencies. But that doesn’t mean Pacoima Beautiful isn’t doing everything it can to move the ball as far along as possible. Since the PLACE Grant was awarded in 2008, Pacoima Beautiful has also received : $5,000 from the Pacoima Neighborhood Council for maintenance of our physical project (click here for more on the physical project), a $ 250,000 RENEW to create a complete streets plan for Pacoima from the LA County Department of Public Health, a $250,000 Urban Greening grant to create a plan for developing green streets to infiltrate storm water and create a stronger pedestrian connection to the Pacoima Wash from the Strategic Growth Council and a Brownfield assessment grant from the EPA to identify and asses potential brownfields adjacent to the Pacoima Wash and plan for their redevelopment for $200,000. In short, Pacoima Beautiful has received over $1,000,000 to change the Wash, and the streets around it, from a blighted car-oriented network to a green people-oriented one. It’s an impressive start, but it’s just a start. So far the only physical change is the lone bridge at the south end of the Wash that Streetsblog discussed last week. Pacoima is a long way from cutting the ribbon on a necklace of new facilities, but the community has a real fighting chance. The PLACE Grant allowed Pacoima Beautiful to “go on offense” to improve the community instead of just fighting rear-guard actions against projects and programs that would acerbate the problems already facing the community. Now, armed with a series of grants and soon an official Vision Plan, Pacoima Beautiful and its allies have begun the march to create a vibrant flourishing community, the kind of place that the residents of the area who have fought and planned to hard deserve. At the center of that community, is a green necklace and a Wash that unites, not divides the community. Are they defining it that way for this project? Usually (from the state highway manual?) Class I is a separated bike path, Class II is the painted bike lane, and Class III is a ‘bike route’ with just signs and/or sharrows. Makes me realize that these terms are really inadequate for all the improvements and pilot projects that we’d like to see. You’re right BC, I had a brain slip there. It’s changed in the article. I LIVE IN ARLETA AND WORK IN SAN FERNANDO….I WOULD LOVE TO RIDE MY BIKE TO WORK EVERYDAY! Here we are in 2016 and no start date in sight. Typical.